At Crescent Blinds we take the safety of our products very seriously which is why we will only provide products and fittings that meet the relevant child safety regulations. Over the last few years products have dramatically changed and developed a lot quicker in a bid to constantly improve and update the way they work to make them as safe as possible. Although the regulations concentrate on ‘child’ safety it also applies to pets and older adults who are just as venerable to injury caused by strangulation. Cord tensioning devices – take up the slack and ability for a child to get their head in to the loop. Wand controls – does the job of the cords but with a ridged wand controlling the inside of the blind. Lite rise and smart cords – all of the working parts for the operation of the blind are hidden inside the headrails with only a handle of single cord being visible to the user. Motorisation – Possibly the ultimate in child safety as the blind is controlled by motors from the push of a button. There are of course some blinds which it is difficult to completely remove cord loops such as the raising a lowering of a standard venetian blind. For this situation the blind is supplied with cleats which are fixed at height above 1.5m from the ground to allow the cords to be wrapped round out of reach from children. Although not a legal obligation to update older blinds that pre-date the child safety regulations from 2014 we would always advise adding a suitable safety device to help reduce injuries. We can supply all relevant devices for your products to either tension the cords or provide a cleat to tie them up out of the way. Make sure all cots, children’s beds and play areas are away from areas which a blind cord could hang into them. Avoid pushing sofas, chairs or anything else that can be climbed up against a blind as children can reach cords that would otherwise be out of reach from ground level. If buying a new blind think carefully about how you and your family are going to use it and choose the best product and safety device to make this as safe as possible for your situation. Our staff will all be able to advise and help you make this decision. As well as the safety of the product itself it is vitally important that each product is installed correctly using the correct fittings to ensure it works properly and is safe to do so. Many injuries have been recorded from whole blinds coming down onto the user due to the fixings not being strong enough or suitable for the environment the customer has. All our staff are trained to assess the installation areas to choose the best form of fixings and if it is not deemed safe to do so they will inform the customer or recommend relevant changes or alterations that must be carried out before the blind can be installed. 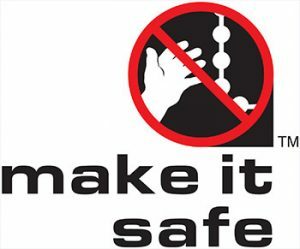 You can find out more about the ‘make it safe’ campaign here – www.makeitsafe.org.uk.